TOKYO, Jan 23, 2019 - (JCN Newswire) - NTT DOCOMO, INC. will jointly exhibit its latest 5G technology in conjunction with NTT subsidiaries and affiliated companies at MWC19 Barcelona from February 25 to 28, 2019. DOCOMO will present business use cases for its latest high-speed, large-capacity, low-latency and massive-device-connectivity 5G technology, which the company plans to launch pre-commercially in September 2019, with official launch slated for 2020. Among the exhibits showcased will be cutting-edge 5G technologies co-developed with DOCOMO partner companies, including a "5G Cyber Jam Session" performance, a "5G Mobile Smart Cyber Operating Theater", a "Diorama Stadium", and an exhibit entitled "Smart Construction Powered by 5G & IoT". 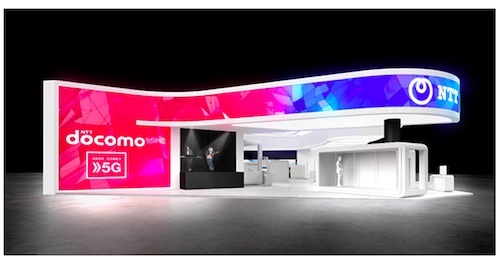 DOCOMO will use these exhibits at MWC19 in collaboration with its partners to demonstrate the feasibility and capabilities of 5G-enabled businesses. In addition, examples of forward-looking solutions based on AI and IoT technologies will also be introduced at the NTT Group section of the booth, where NTT Group companies will be exhibiting a range of uses for these technologies across diverse fields in preparation for the future "Smart World". Separately from the above, the NTT Group will introduce examples of advanced, globally-developed technologies for public safety, mobility/logistics, manufacturing, agriculture and other industries through exhibits such as "Smart City", "Smart Airport", "Smart Agriculture" and "Smart Factory".